I am going through the most stressful time of all. The two kids and the husband is severely unwell for the past few days and to top it off my maid is absent for more than a week now. Blame it on the whimsical weather which keeps on changing keeping in mind the popular Bollywood hit ('Kabhi Khushi Kabhi gum' ) as Kabhi thand Kabhi Garm. Jokes apart right now am in such a state that can't even remember when was the last night that I slept properly. The constant coughing and crying keeps me awake all night. which I would not have mind if it had provided enough comfort to the little ones to sleep properly. Today most probably is the day when after a long gap of 5-6 days all three of them are sleeping quietly (Touch wood and Thank God for that.) and ironically the most tired me cannot sleep. I tried lying on the bed for quite sometime but no Sleep dint bless me this afternoon so here I am. sharing a recipe which well if not definitely but might save you from such misery. I mean seasonal cough and cold and to some extent from Pox. It is a known fact that Drumstick or Moringa oleifera (Bengali Sojina or Sojne) is a wonder plant. All Parts of this plant including leaves, flowers and fruits are edible and an excellent source of protein, Vitamin, Calcium, potassium and antioxidants. From the era of ManuSamhita It has been advised to use parts of this plant to cure many diseases. Especially in Unani medicines the flowers of these plants are broadly used to make medicines for Liver problems, common cough and cold and for deworming medicines. Though the leaves are known to be the most beneficient still the flowers, fruits, seeds and barks of this tree is used for making herbal medicines even for blood pressure, tomours and leprosy. The best part is it provides the body all its required proteins, vitamins and nutrients without being heavy on fats or calories. No wonder this plant is often referred to as the Tree of life. 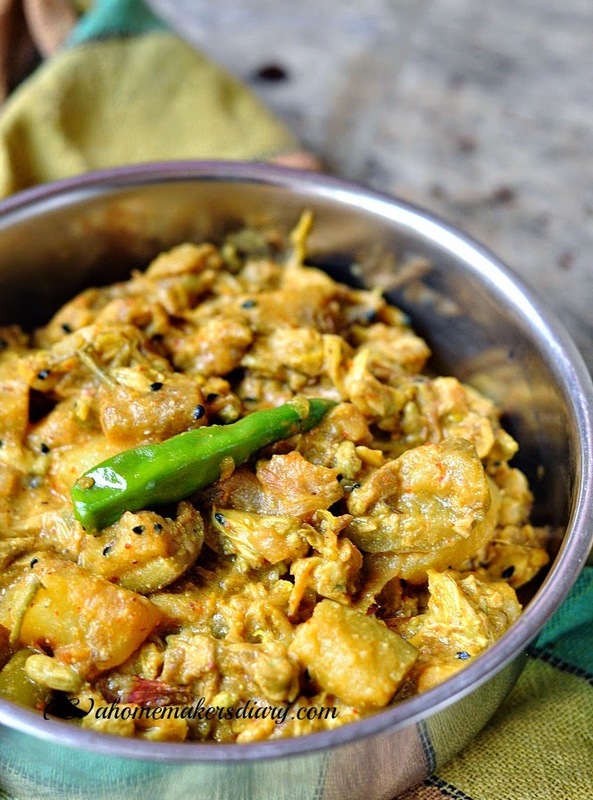 The recipe that I am sharing today is called sojne phuler torkari. This is my own recipe that I have adapted to suit our tastebuds. Pick and wash the flowers properly and drain on a colander. Heat oil and temper with the nigella seeds and slit green chillies. Once the splutter chop the onion and add to the oil. saute for a minute and then add the potato and brinjal pieces. Add salt and turmeric and mix. Cover and let it soft and cooked (approx. 7-8 minutes.) Keep stirring in between to avoid burnign at the bottom. 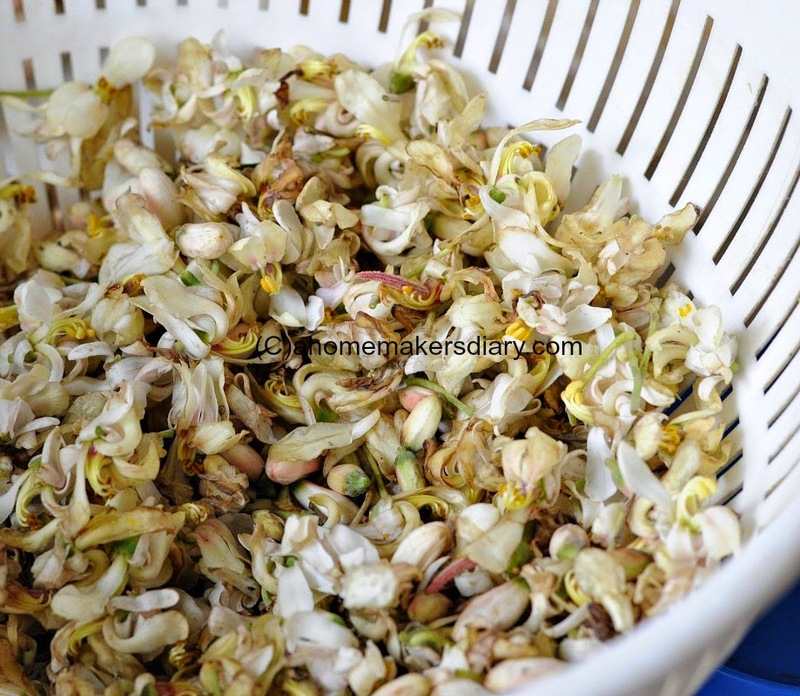 Add the well drained Moringa flowers and mix. Adjust the seasoning and cook for a minute. Then mix in the poppy seeds and mustard paste. Stir to mix well and cook to get away with the raw smell of the spices (2 minutes). Add 3/4 cup water and bring it to boil. Cover and let it boil and bring all the flavours together on a medium flame. Adjust the seasoning if needed. Finish with a drizzle of 1/2 tsp mustard oil. Tough time dear..hope they get well soon. You too take care of yourself. .
New ingredient and dish to me :) looks yumm ! !